NAMI Shoreline is a subsidiary of NAMI Connecticut, which is continuously working to improve public policy for people with serious mental illnesses in Connecticut. The Public Policy Agenda includes many issues that aim to increase access to treatment and services, and to repair and restore the mental health service system in our state. At NAMI Connecticut, we are continuously working to improve public policy for people with serious mental illnesses in Connecticut. Our Public Policy Agenda includes many issues that aim to increase access to treatment and services, and to repair and restore the mental health service system in our state. 2-26-2018 THE LEGISLATURE NEEDS YOUR STORIES! Legislation on Mental Health Parity will be getting a public hearing soon (before the Insurance Committee; probably around March 6-8) and your voice will be crucial and powerful at this hearing! PLEASE BE PREPARED TO SEND US YOUR TESTIMONY, especially if you have PRIVATE INSURANCE! In the meantime…. think about instances in which you have struggled to find an in-network provider for you or your loved one; barriers you faced, whether you had to use an out-of-network provider, and did you pay extra for services you feel should have been covered by your private insurance? Or alternately, a situation where a needed behavioral health service was DENIED by an insurance company, with no alternative solution offered by that provider? Did that leave you scrambling, making phone calls and taking other steps to find a solution? Think about how you would give Legislators a real understanding and feel for the stress (both emotional and financial) that these scenarios have caused you. Also if possible, give an example of a positive outcome that you have experienced when a needed service was approved and paid for without you having to pay out-of-network costs. And remember that you will also want to thank the Legislature for taking the time to listen to your lived experiences. Again, we will be reaching out soon with the details of the public hearing, as well as a TEMPLATE you can use to draft your testimony. Visit www.namict.org to keep updated on your chance to HELP! YOUR Budget Advocacy is Vital AGAIN – NOW! Budget negotiations at the Capitol are in the final stage, and votes are expected very soon. We need to make sure legislators remember the importance of protecting mental health and other safety net services! CALL or EMAIL Your State Representative and Senator (again) and urge them to PASS A FAIR AND BALANCED BUDGET THAT INCLUDES ADEQUATE REVENUE INCREASES IN ORDER TO PROTECT MENTAL HEALTH AND OTHER COMMUNITY AND SAFETY NET SERVICES! Mental health services include: Legal, Advocacy, and Community Based Services, Housing, Young People Services and Grants. If you’re not sure who your local legislators are, you can use this link on the legislature’s webpage‘Find Your Legislators’ and simply put in your address, click ‘Find’ to see their names and links to their websites and contact information. Our elected officials need to hear from you NOW, because final negotiations are happening right now. THANK YOU for stepping up again and making sure our Voices are heard! The Senate delayed a vote on the Better Care Reconciliation Act (BCRA), but they are back at it—and they are moving fast. A vote could happen any day. They have revised the bill and it isn’t better, it’s worse. New language would let insurance companies offer bare-bones plans with no mental health coverage. This is a giant step away from parity, or fair coverage of mental health conditions. There will still be less financial assistance and fewer protections for people who buy individual health insurance plans through the marketplace. The bill still cuts and caps the Medicaid program, which will make it harder for people to get psychiatric medications, case management, mental health services—and even hospital care. Millions will still lose their Medicaid coverage, including 1 in 10 veterans who rely on Medicaid for health and mental health services. The bottom line: this bill hurts people with mental illness. But, the fight is not over. Together, we are powerful. 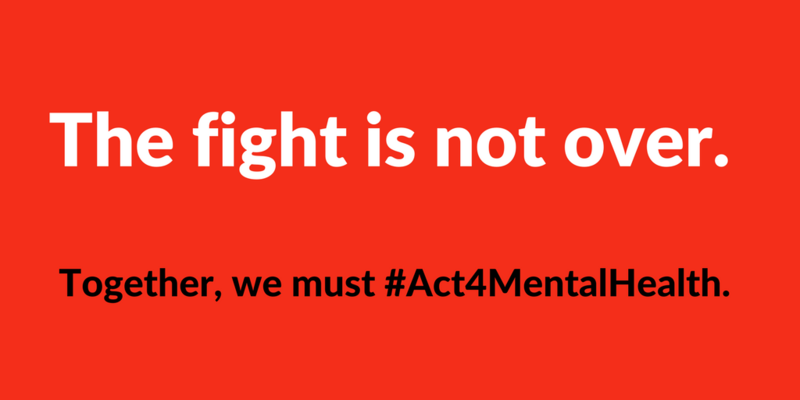 Together we can #Act4MentalHealth. Tell your Senators to vote NO on the BCRA. Write to your state representatives to oppose Governor Malloy’s budget cuts which will negatively affect the research at the Yale School of Psychiatry and Connecticut Mental Health Center. NAMI Connecticut is an active member of the Keep the Promise Coalition. The Keep the Promise (KTP) Coalition is a Connecticut-based network of advocates, including people living with mental illness, family members, mental health professionals and interested community members. KTP is dedicated to advocating for a comprehensive, community mental health system for adults, children and families in Connecticut. Click HERE to visit the KTP website. NAMI Connecticut’s Public Policy Program mission is aligned with KTP by advocating for improved services, more humane treatment, and an end to stigma and economic and social discrimination. Our goal is to support members to engage in advocacy activities at the legislature, in the community, and from their homes. NAMI Connecticut and the Keep the Promise Coalition have shared legislative priorities. NAMI Connecticut’s Public Policy Committee consists of members from around the state who meet monthly to build consensus on legislative and policy issues, provide feedback, assist in developing the Keep the Promise Coalition’s legislative agenda, and act as committee liaisons in their communities. For more information to go www.namict.org and click on “Public Policy and Advocacy” and “Resources”. Also look for Public Policy and/or Advocacy SPECIAL EVENTS on this website.